Hi Snoopy! turns out we got dressed up for nothing! We weren’t invited! What’s up with THAT???!!! Thank you for your wishes!! The wedding was beautiful!!!!!!!!!!!!!! Awwwwww!! 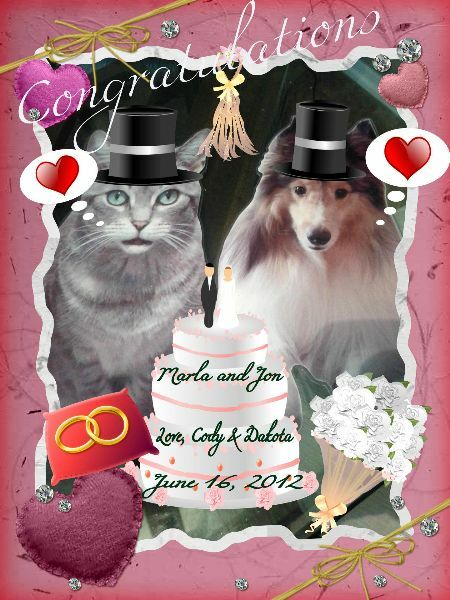 Me and Charlie wish Marla and Jon a wonderful perfect day today! Yay!! Thank you Charlie and Mum!!! Don’t we look British in our hats? Hey, today’s my 21st wedding anniversary ~ how cool to share our special day with your sister! Sara!!! HAPPY ANNIVERSARY!!!! 21 YEARS!!! WOW!!! It IS cool to share your special day with my sister! Thank you so much! No, I’m afraid no cake for me. Mom will eat it all up! BOL! Dakota, you and Cody look gorgeous in your top hats! Congratulations to your sister! Hope you all have a wonderful time and of course, some yummy treats too! Thank you so much!!!! We look quite dashing!! BOL!!! thank you so much Fenris, Socks and Scylla!! Happy Wedding Day to your sister. You two look ready for the celebration. Congrats to the happy couple!! We wish them a life time of fun and love. Congratulations to the bride and groom. WOW you and Cody sure do look handsome. It’s amazing how well we clean up when we want to isn’t it. You look very dapper all dressed for the occasion! Best wishes to the new couple! I hope you guys had a ball at the wedding…ya looked great! Hope ya didn’t steal too much attention from the bride! @Novroz, I am still waiting for my wedding to Eva too!!! BOL! She’s hard to pin down!